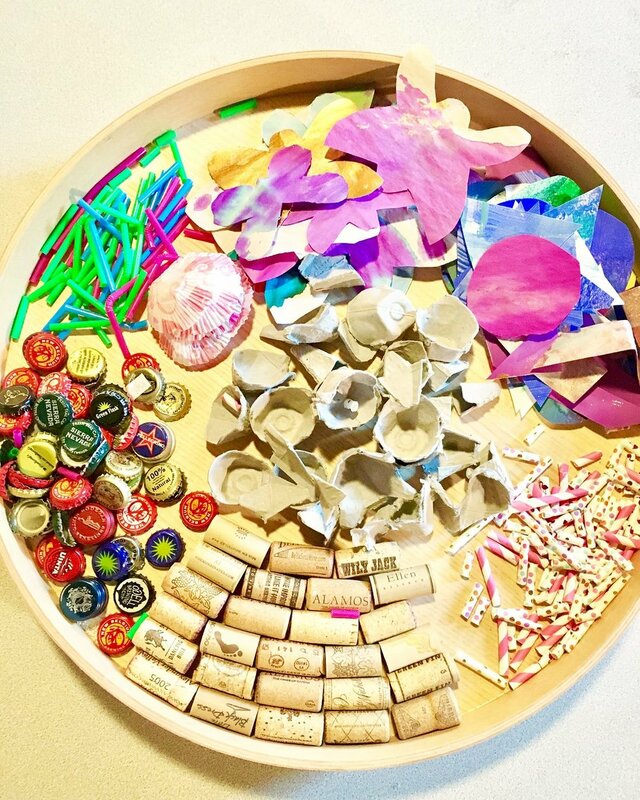 Today's art invitation was a lazy susan with piles of recyclables. The children have glue, scissors, cardboard and active imaginations. Some come to the table and are inspired to build a specific thing but many come just to experience. All of the children at the table are deeply engaged in their work. They are developing their fine motor skills when squeezing the glue bottles, using scissors or carefully placing the small objects. They are exercising critical thinking skills, while sorting, planning and counting. When there is a large group at the table they have the opportunity to gain life skills by negotiating space and deciding how to take turns rotating the lazy susan. These amazing pieces of art build confidence and pride. Their interests may move on to the next thing, but this experince will stay with them forever.